Thank you for registering to attend this Festival of Glass workshop. Your balance will be due to be paid by the first day of your workshop. The balance should be forwarded to BSB 633-000, Acc No. 149762791. The account name is D.C.S.C.A. Please remember to familarise yourself with our Withdrawal policy. We look forward to welcoming you to the 2019 Festival of Glass workshops. Tutor: Davide Penso, Murano, Venice, Italy. Davide Penso, Murano, Venice, Italy is an internationally recognised jewellery designer & glass artist who has taught widely in Europe & the USA. He will give individual guidance & assist you to turn your jewellery ideas into unique, well engineered, stylish wearable pieces. Learn more at: www.davidepenso.com and on his Facebook page. 9.00 am - 5.00 pm daily. 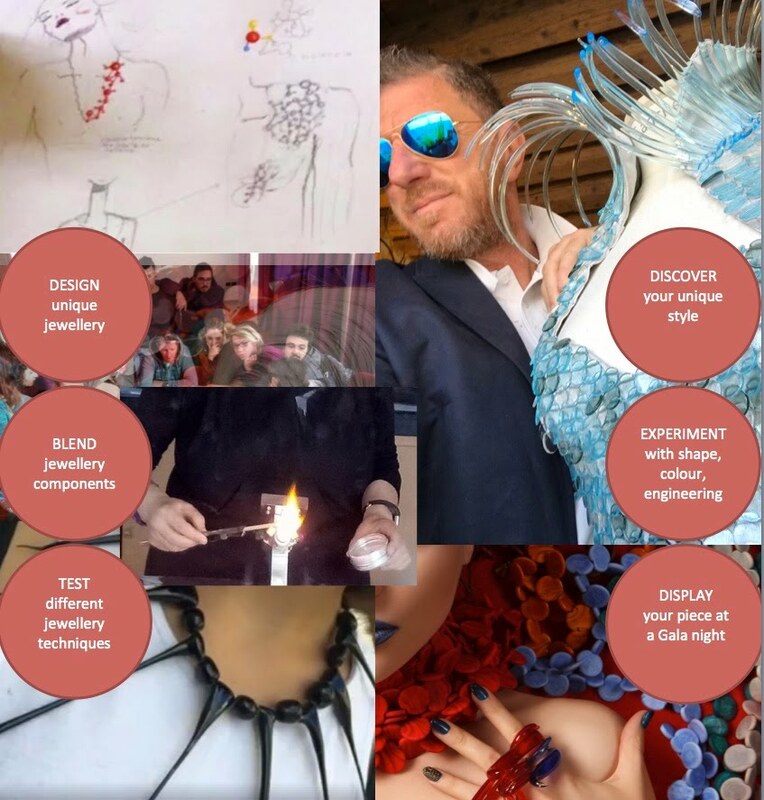 DESIGN your project by exploring design techniques & analysis of jewellery styles. START making simple fast glass shapes including headpins and simple beads. EXPERIMENT with sketching, play with shape, colour & ‘engineering’. PRACTICE more glass shape making techniques including fusing, or blowing depending on the experience and interests of participants and their design journey. DISCOVER finishing techniques for stringing and wiring your piece including knots, clasps & how to close a necklace. EXPLORE cold-working glass grinding techniques including ‘battuto’ on beads. Other demos and techniques will depend on student interests and their design journey. CREATE & BLEND customised components for your project. FINALISE your project with support & supervision. Learn how to exhibit & sell; prepare for the Gala event. CELEBRATE. Wear your piece at a “Glass Glitz & Glam” gala dinner event at a local restaurant. Invite friends & family. NB: Please note that the program will be adapted and added to depending on the specific progress, interests and skills of those attending. Tools required: All tools will be provided. However if you wish to purchase tools you can order them at the point of registration. Day 1, 2, 3 & 4 $1200 per person per 4 days (includes all materials & tools needed). BALANCE - DUE PRIOR TO THE FIRST DAY OF THE WORKSHOP. DO I NEED TO WEAR SPECIFIC CLOTHES? Working with hot glass has specific safety requirements that need to be followed. •	Wear natural fibre clothing. •	Wear closed toe shoes; have a pair of “studio shoes”. •	Use a lab coat, cotton or leather apron, Kevlar sleeves or a long sleeved shirt with natural fibres (cotton or wool). •	Long hair should be tied back. Do not wear loose or hanging jewellery. •	Wash hands before eating and after leaving the studio. •	Damp clean to prevent movement of frit dust. •	Ensure cold water and/or burn cream is easily to hand when you are working at the torch. •	Keep bench top organized. •	Drink lots of water to prevent dehydration. •	Stretch and/or move around periodically. •	Do not use any equipment without an instructor present. •	Please discuss risks with your doctor before attending a workshop involving hot glass. The Festival of Glass committee has to plan these workshops many months in advance and ensure that each one will be self-financing; only then can we invite our Resident Artist/s to travel to the 2019 Festival. If a workshop has more than the minimum number of attendees, a potential attendee who withdraws prior to 18th December 2018 will forfeit 75% of their deposit. Any potential attendee who withdraws after 17th December 2018 will forfeit their deposit. If a workshop is cancelled at any time, potential attendees will receive a full refund of the fees that they have deposited. A potential attendee who withdraws before 17th December 2018 will receive 75% of the fee that they have deposited. A potential attendee who withdraws after 17th December 2018 will forfeit whatever fee they have deposited. If a workshop is cancelled at any time, potential attendees will receive a full refund of the fee that they have deposited. Anyone who has booked into a workshop and wishes subsequently to withdraw should notify the Workshop Co-ordinator by e-mail (festivalofglassdrysdale@gmail.com). The Workshop Coordinator will acknowledge receipt of the request to withdraw and arrange to refund the appropriate percentage of the fee that the person has deposited. DO WE PROVIDE OUR OWN LUNCH? Yes, you will need to provide your own lunch. There are several venues nearby - please use this link to see some of the options available. WHAT TRANSPORT AND ACCOMMODATION OPTIONS ARE THERE? WHAT OTHER EVENTS IS THE FESTIVAL OF GLASS RUNNING AT THIS TIME?